St. Lucia's beauty isn't just there for the taking. It may, however, be offered to you. I first grasped the island's genuine charm as we pulled up to a dock in Soufriere (boating around the island is infinitely easier than driving around it). There, a group of young boys wearing nothing but basketball shorts approached our group, offering to sell us crafts made from palm fronds. We told them no thanks. One kid pivoted. "You want weed?" he asked. "No," I said, laughing. "But thank you." He smiled and handed one of the women in our group a palm leaf contorted to look like a flower. She blushed and declined it, but the boy insisted. "Even if they don't buy it for you, I give it to you," he said, handing it to her and walking away. His game wasn't the nonstop peddling some travelers get accustomed to in developing tropical locales. Rather, it was a genuine friendliness, with an underlying tone of the hustle. Friendly as the locals are, their home remains a tough little island. It's tourism-friendly, but not designed for tourists. 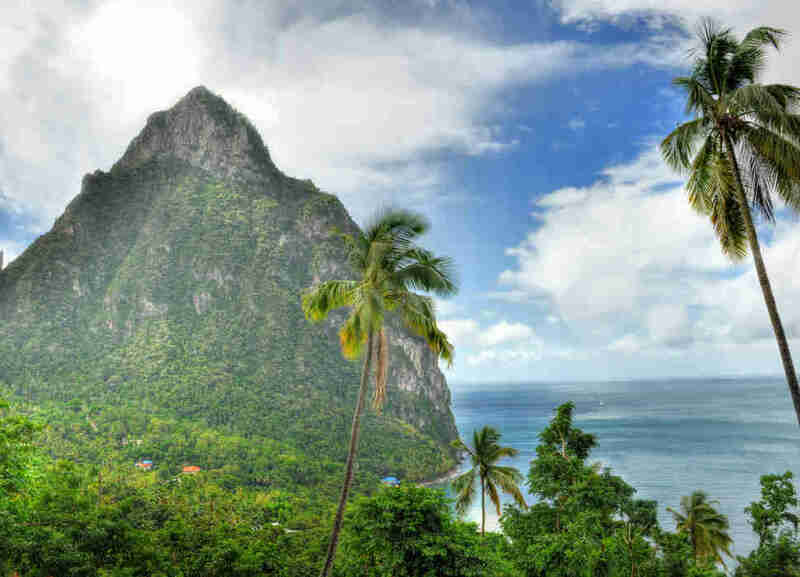 It's a place where you can kick back in a luxury resort shooting rum and gorging on panoramic views of the rugged volcanic spires called the Pitons -- or, a mile down the road, sit outside a bodega with a questionably employed local and drink the local beer, also called Piton. It's an independent Caribbean country, so there's no money from Europe or the US propping up its infrastructure. It's raw without being dangerous, and strikes that balance of natural wonder and authentic comfort better than anywhere in the Caribbean. The town the boys retreated into, Soufriere, or "sulfur" in French, is named for the springs that bubble nearby -- and, likely, for the smell. Like if we renamed New York "Urine," or New Orleans "Hangover." It's a seaside tropical paradise with a hint of stink bomb in the air, a place where you’ll feel relaxed but still never completely comfortable. You'll forget the smell, though, as the harbor opens to narrow streets lined with stucco buildings. At the bodegas there, people lounge out front with no apparent occupation or desire to find one. But as we walked past, instead of hitting us up, they greeted us with a smile and a "How do you like St. Lucia?" Even a simple commute in St. Lucia keeps reminding you that you're on a rugged, gorgeous isle. 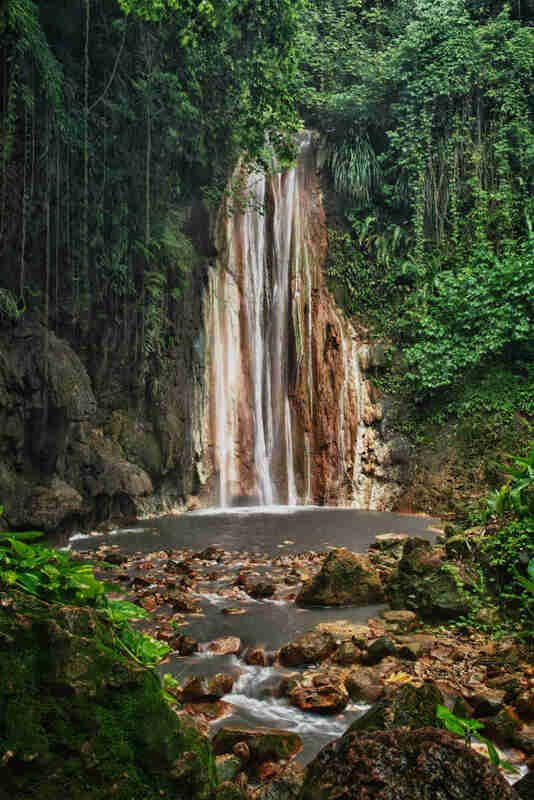 We crammed into a van and began the treacherous trip from Soufriere to Anse Chastanet, a beach and resort on the other side of a foliage-filled cliff. The van rumbled up and down a narrow, winding road, "paved" in name only. As we bounced through banana plants and giant ferns, the Caribbean Sea peeked at us through every small clearing. The barely two-mile ride was 20 of the most painfully beautiful minutes I'll ever experience, aided by drivers calmer than I've seen elsewhere in the Caribbean, able to navigate single-lane roads against sheer drops even when a van approaches from the opposite direction. At Anse Chastanet, we found a beach totally unspoiled. The sea there gives way to a small strip of sand, then an epic green cliff that looks across the bay at Soufriere and the Pitons. It's the best snorkeling and diving site on the island, not only because it has a coral reef shelf and a wreck, but also because when you surface your first view is of imposing green peaks towering over the sea. The view above water is almost as incredible as the tropical hues below. 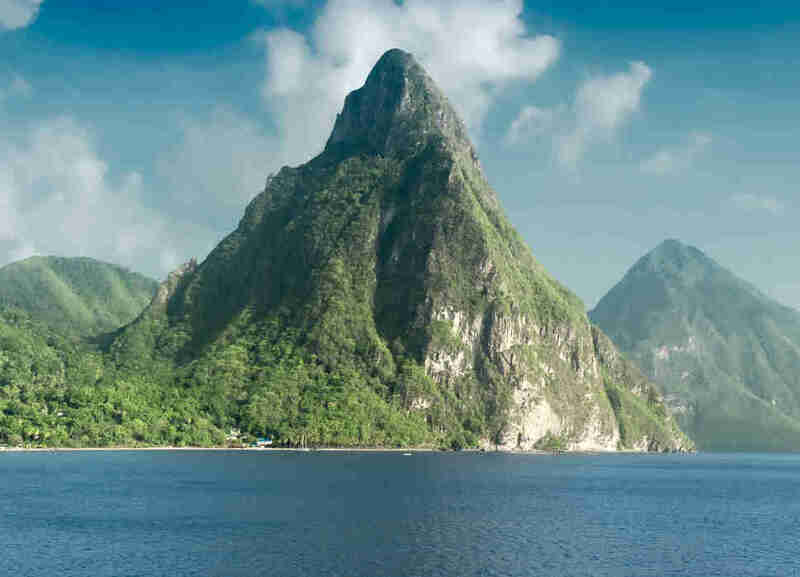 Jutting straight up out of the sea like big middle fingers, daring any adventurer to scale them, the Pitons are the most iconic of St. Lucia's mountains (yet not the tallest; that's Mount Gimie, a couple of miles inland). And though it's not easy, you can indulge in the king-of-the-world view from the top. The taller of the pair, Gros Piton, is also the legally climbable peak, up to a reasonable 2,619ft summit that takes about five to six hours. 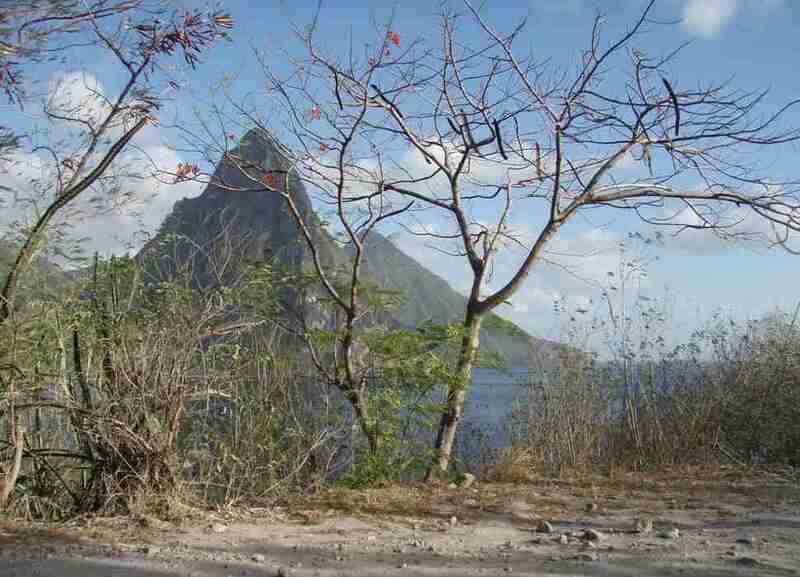 The smaller -- Petit Piton -- is far steeper and requires climbing gear, with no hikes commercially available. As one frequent visitor told me, "I tried it once, and got a third of the way before I realized there were better things to do on this island." Hiking Gros Piton is quintessentially St. Lucian. It's not easy, but if you're in shape and willing to accept the challenge you can conquer it in a day. 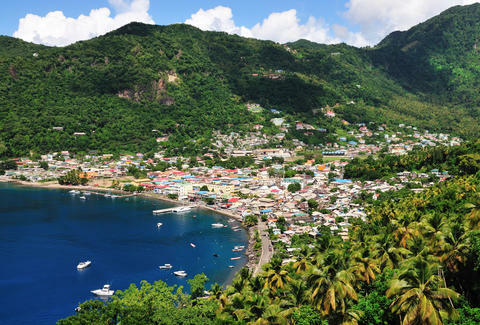 There are higher mountains in the Caribbean, but they might take two or three days -- and when you’'e on top of Gros Piton looking across to St. Vincent, puffing hard and feeling the breeze on your sweaty brow, you'll care not one bit. Though hiking the Pitons is an active way to see a dormant volcano, St. Lucia is also a fine place to see an active volcano and remain completely dormant. When we left Soufriere, we headed toward an even stronger sulfur smell. Our van pulled up to Sulfur Springs, the stinky, steamy park that lives in the remains of a once-epic volcano that stood over the island. The caldera still steams and bubbles as park visitors drive through, as if taking a tour bus through the center of the Earth. At the entrance to the park, a square concrete bath sits below the road. There we took a short dip in the mineral-rich water. 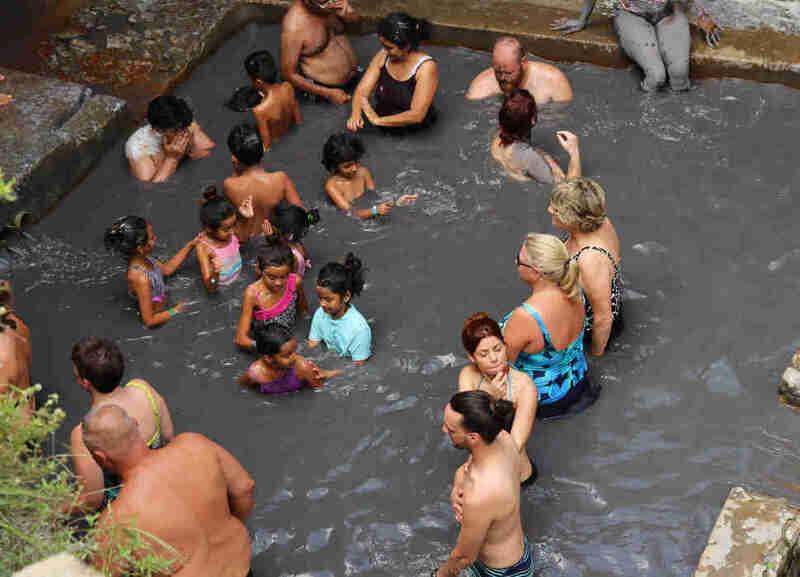 It's not unlike going to a fancy hot springs in California, except in St. Lucia the wealthy tourists are covering themselves in odiferous water right next to local old men in worn-out thongs. They're joined by kids, school groups, cruise groups, and island families. Truly a cross-section of the Western Hemisphere covering each other in mud. Outside the bath, two local men in their 20s spread gray mud on pasty tourists, covering them in a thin ceramic film from head to toe. They work for tips -- their job is literally putting mud on people -- and business seemed strong. Probably 50 people were standing, waiting for their mud baths to dry, like a platoon of chubby soldiers in white war paint. It is luxurious and painfully Caribbean all at once. Hustlers earning money off tourists, while their families enjoy a Sunday mud bath. All of it reeking of earth and stink bombs, all of it feeling fancy and raw. St. Lucia isn't all jungle mountains and skinny roads. If you're into all-inclusive resorts with white sandy beaches and fruity drinks, the northern part of the island has you covered at Reduit Beach and Rodney Bay. But to see why St. Lucia can both relax you and challenge you, the south end of the island awaits. There, even the top-end resorts plop you into the elements. The ultra-luxe Jade Mountain features mountainside suites with front-row views of the Pitons, four-post beds, and in-room infinity pools. And three walls. The sun is your alarm clock, and the only A/C is the breeze off the ocean. 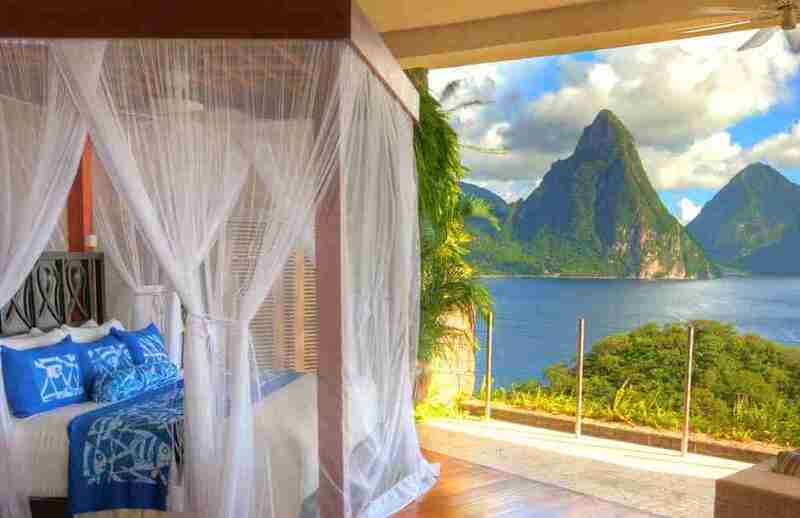 The Sugar Beach resort, Viceroy's offering between the Pitons, sits on the shore between the mountains, and requires a treacherous drive or climb to get in or out. If you live in a city, the mountains feel like dark condo towers at night and give the hotel an eerily remote and inescapable allure. As an American accustomed to supermarkets and smooth roads, you’ll want to go home eventually. But you can also understand why the locals never do. And it was best summed up by a conversation I had with my dive guide as we watched the sun set after a dive. "It takes me two days just to apply for a visa to the US," he told me as we stood on the beach at Anse Chastanet. "We have to go to Barbados, spend the night, do our interview in the morning, and we only get it if the customs guy is in a good mood. Last time he told me my application didn't convince him I wasn't going to say there." "Hell no, man," my guide said as he pulled his head back, shocked that I'd even ask. "America's cool, but look around you. Why would I ever want to leave this place?"